In an unprecedented event, two earthquakes shook the coast of the Yukon-Kuskokwim Delta Tuesday night. The quakes hit about 45 miles offshore from the community of Hooper Bay, and seismologists are looking closer at the unusual temblors. Earthquakes are common in Alaska; dozens are registered each day. Seismologist Michael West with the UAF Alaska Earthquake Center says that his team often knows where to expect them and why they are occurring. “In some senses, unless they’re big, we kinda yawn,” West said. Earthquakes are rare in Southwest Alaska, and quakes have never been recorded anywhere within a hundred miles of where these two struck. The first quake registered at a 4.9 magnitude and hit at 10:42 p.m.
“We would consider that to be the main shock,” West noted. The second quake was less powerful, registering at a magnitude of 3.6 and hitting a half hour later at 11:12 p.m. Early evidence suggests that the quakes align with faults that lie several hundred miles to the east of the epicenter, offshore from the Delta. People living in coastal Yukon-Kuskokwim communities felt both quakes as minor tremors, and nobody has reported damage or injury. Jan Olsen was just sitting down to watch TV in Hooper Bay when he felt his house move. “And I thought somebody was coming up the steps and shook the house,” he said. But no one came in the door. Olsen has little kids, and thought one of them might have been jumping on a bed. Then the VHF crackled. “We started hearing on the radio, ‘Did anybody feel that? Is that an earthquake?’” Olsen said. In Mekoryuk on Nunivak Island, Amanda Shavings had a similar experience at home with her husband. At first Shavings thought the house was shaking from the strong winds that blow across the island, but those shudders are short, and this movement kept going. They realized what was happening. Immediately, Shavings and her husband searched the web for a tsunami warning. None appeared. Meanwhile, Facebook started filling up with posts about the quake. Shavings works for the Mekoryuk tribe, and one of her duties is to create an emergency plan for the community. Including earthquake response has now become a priority. 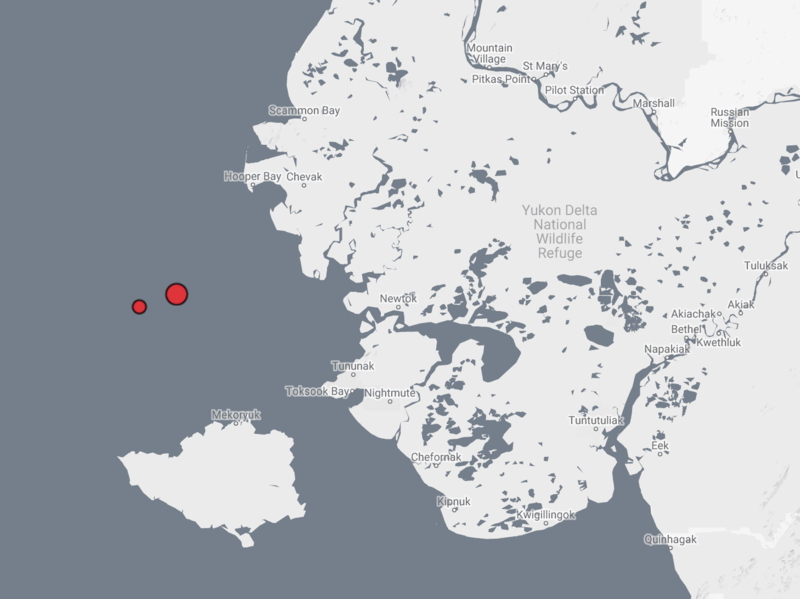 Original Story: In an unprecedented event, two earthquakes shook the coast of the Yukon-Kuskokwim Delta Tuesday night. The quakes hit about 45 miles offshore of the community of Hooper Bay. People living in coastal Yukon-Kuskokwim communities report feeling both quakes as minor tremors, and no damage or injury has been reported. Earthquakes are a daily occurrence in Alaska, but not in this area. Seismologist Michael West with the UAF Alaska Earthquake Center says that these quakes are the first to be recorded within 100 miles of where they struck. The first quake registered a magnitude of 4.9 and hit at 10:42 p.m. The second quake was less powerful, registering at a magnitude of 3.6 and hitting a half hour later at 11:12 p.m.